Why should a Jain renounce milk for Paryushan and Das Laxan? 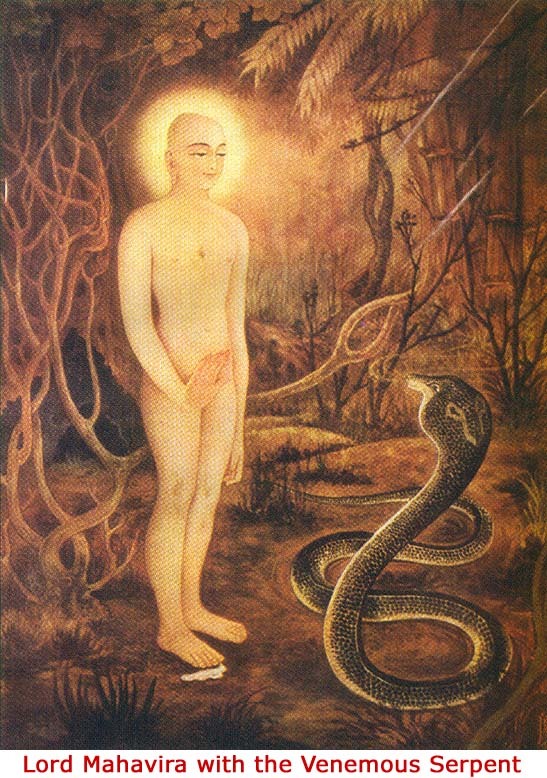 This photo depicts the story of Lord Mahavira meeting the angry serpent Chandakaushik whom he met while meditating in the forest. He is so filled with compassion that he does not harm the snake. When the snake bites him, milk issues forth from his foot. He is as filled with love for the snake as a mother is for her child. As Jains we have abstained from meat and eggs for thousands of years. Our practice of ahimsa has lacto-vegetarianism as a moral baseline. So now, why vegan? Here we’ll cover the hinsa involved in milk products. We’ll do a separate post on eggs. On a Jain site, we hope we don’t have to explain what’s wrong with meat! We can read the words as they’ve been passed down through Lord Mahavir’s disciples and consider in modern times, would Lord Mahavir have told us it is OK to consume milk? Consider this question as you read the facts. 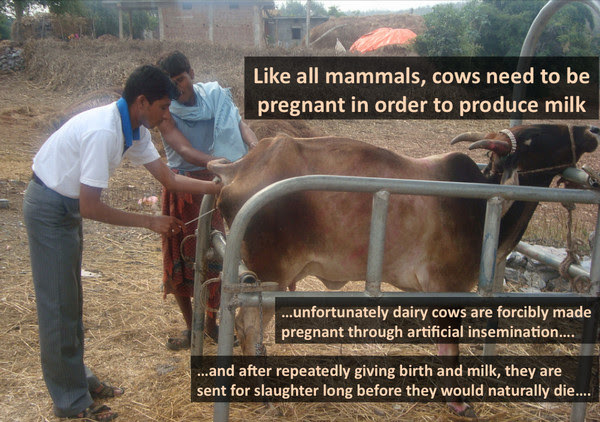 A cow raised for her milk is forcefully impregnated yearly, and her babies are taken away within few days. She is either pregnant or lactating 9 or 10 months out of every year only to have the cycle repeat once she gives birth. Certain amounts of pus and blood are legally permissible in milk. We use this milk in pujä and other ritual. Dairy cows are no longer vegetarian. Along with grains, they are fed unnatural, high-protein diets – which include dead chickens, pigs, and other animals. Using powerful hormones, the cows are forced to produce 6 to 8 times as much milk as they naturally would. Also in spite of heavy use of antibiotics, these animals develop mastitis, open wounds and other infections. A cow’s natural lifespan is about 20 years, but cows used by the dairy industry are slaughtered after only 4 or 5 years, and their meat turned into pet food or hamburgers. Or in India, their meat is exported. All calves are taken from their mothers within few days. Female calves become dairy cows and Male calves become veal. They are kept confined, many in dark, tiny crates, where they are kept almost completely immobilized so their flesh stays tender. They are slaughtered in about six months. The Jain Vegans Working Group issue a compelling plea based on the suffering and death involved in dairy product consumption. Please give up dairy products during this time that Jains traditionally fast, introspect, repent for past misdeeds, and make vows for spiritual purification. Paryushan, the Jain festival of penance and forgiveness will begin very soon. During the festival, followers of the Jain faith traditionally fast, repent, and forgive. For lay members, fasting often entails avoiding activities that are traditionally thought to cause more himsa than others, such as eating root vegetables or eating after sunset. As someone who has come across the activities of the Jain Vegans Working Group, you will be aware of how our consumption of dairy (organic or conventional) leads to the immense suffering and murder of innocent cows. Dairy cows will normally get slaughtered before the age of 7, even though they could live up to 20 years if given the chance. This is because at around that age her milk yield drops, and it does not make financial sense for a farmer to keep her alive when he is able to obtain milk from her younger (and more productive) daughters. In light of all this, it seems reasonable that during Paryushan we as Jains should acknowledge and reflect on the suffering we have imposed on cows as a result of our consumption of dairy products. Jain Muni Ji Shri Vihar Sagarji Maharaj explains that jivdaya is not consistent with consuming milk. He shows photos of the situation of dairy cows in India and explains that by participating in this violence, we invite negative karmic consequences and suffering to ourselves. He urges us to quit taking milk and milk products. The video is in Hindi but English subtitles are displayed. This is revolutionary! This muni has taken a courageous stand, in contrast to others that simply defer to tradition and refuse to see and speak truth. The back story of this video is also interesting. Fauna Police is a rescue organization in New Delhi and Abhinav took the video below. It seems that Jain friend Gaurav had introduced Abhinav to the muni. Now that I follow Abhinav’s facebook page, I see that an increasing number of munis have been exposed to the truth behind dairy and some have agreed to abstain from dairy products. Fauna police’s blog and YouTube Channel are impressive. It is tremendously hopeful that change is occurring in India! 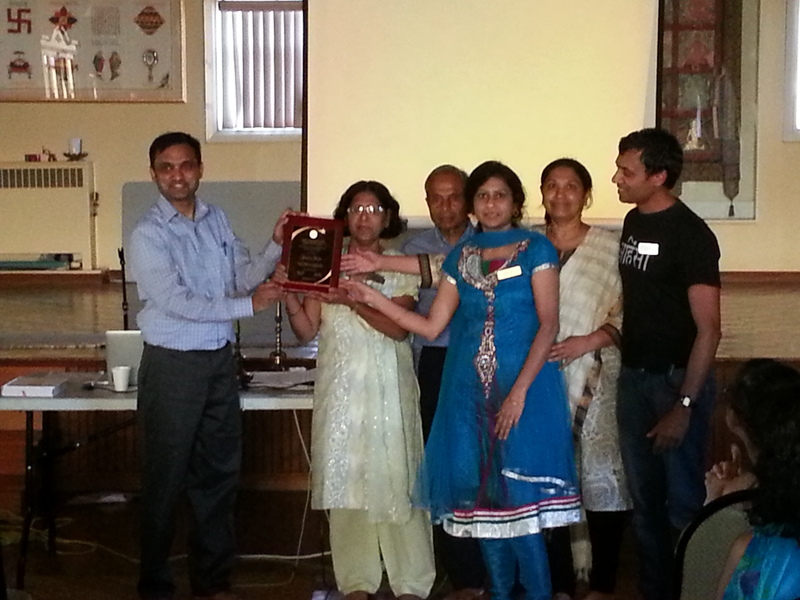 Jain Society of Toronto celebrated Jeevdaya day on June 29. The event was organized by the Jeevdaya group an informal group set up to educate and involve Jain Community in compassion activities. There are several words to describe “compassion” in our tradition(Jeevdaya,Karuna,Pranatipat virman). This is fundamental to Jainism. It was a whole day event. Dr. Tushar Mehta was the Master of Ceremonies for the event.It started with a presentation by Dr. Tushar Mehta on the health benefits of a plant based(vegan) diet. 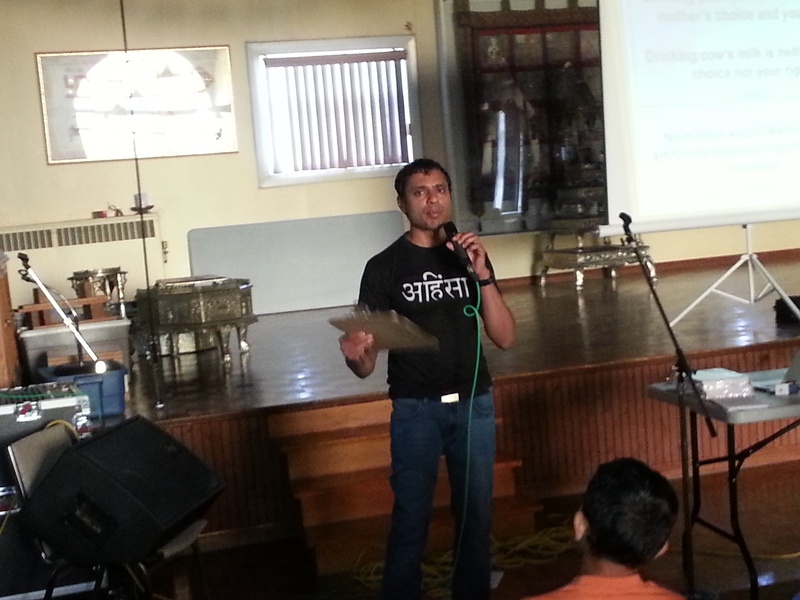 Next, Sanjay Jain made an excellent presentation on Jeevdaya describing how his convictions grew over the years as he was confronted with choices. These choices led him to abstain from pearls, silk, leather, wool and eventually dairy. 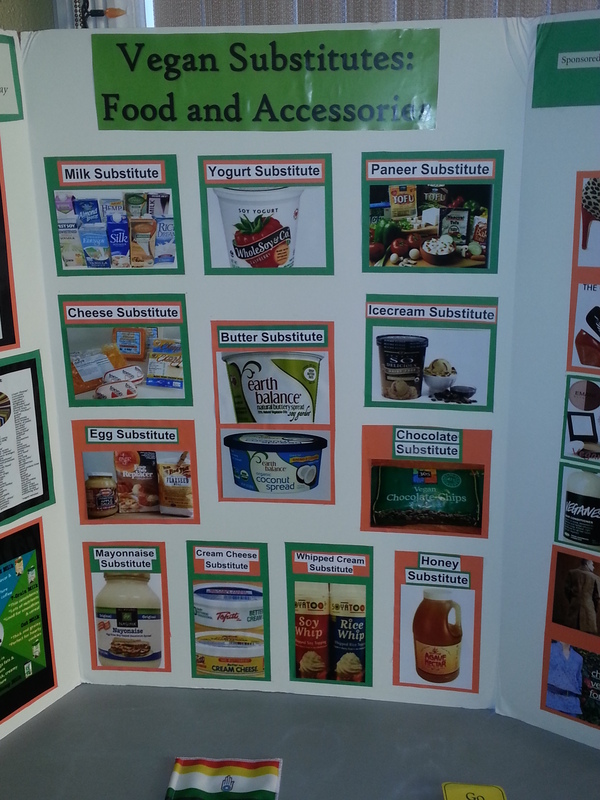 At every stage he was enthusiastically supported by his wife Prachi.Sanjay also arranged a display with ten posters and several models which described how current practices in food industry involve extreme cruelty. This was very well received. UC Berkeley had a screening last week of a movie called “The Ship of Theseus” by Indian Filmmaker Anand Gandhi. Featuring 3 stories of people with donated organs, the 2nd story presented a monk named Maitreya, who by all implications (though not stated as such) was a Svetambara Jain. He was portrayed sympathetically, going to the Indian high court with a meat eating lawyer, arguing for better treatment of animals in research, and elimination of cosmetic and non essential testing. His adversaries are representatives of pharmaceutical companies. There was footage of draize testing, with substances placed into the eyes of rabbits, clearly unnecessary and brutal. He was shown carefully placing a caterpillar on a leaf, out of the way of trampling human feet. The lifestyle of the monks was also shown quite poignantly, walking barefoot in pouring rain, searing sun, taking only small amounts of the food offered to them, but oddly that food included milk or a milk product such as kadhi (yogurt soup) . And hence the disconnect. The movie actually portrayed him saying the word “vegan”, as in he didn’t expect the world to go vegan overnight, but it was unclear if the movie intended to show the contradiction that , traditionally, Jains eat dairy products or it was an oversight. But his ethical dilemma was not about eating dairy products; rather it came when he was diagnosed with liver cirrhosis, likely from a parasite that was portrayed under a microscope. For a long time he refuses to take medicine as he knows it has been tested on animals. There is even speculation that he will undergo sallekhana the fast until death that Jains with terminal illness sometimes conduct. But (spoiler alert) at the end he decides he wants to live. He takes medicine, accepts a liver transplant and at the end of the movie is shown in laymen’s clothes. The movie leaves open to question how he has reconciled his previous stance with the compromise that he had to make to save his life and whether he decided to leave the monk’s life. As dissatisfying as some of the contradictions of this portrayal were, the movie brought to life the Jain emphasis on ahimsa and the severe discipline of the ascetic life. I asked the filmmaker, who was present at the screening, if there was any real monk on whose story the character of Maitreya was based and he answered, along the lines of what you can find in the Wikepedia entry for the Ship of Theseus, that Maitreya is a composite of Satish Kumar, Mahatma Gandhi, Abhay Mehta, and Shrimad Rajchandra, none of whom (as far as I know) actually address/ed animal testing or veganism. I hope that I’ve simply not been informed, but I am not aware of any Jain monks that have taken an activist stand, engaging and trying to change the mainstream society’s ideas of animal abuse, apart from opposing animal slaughter for meat. And perhaps that’s why this, opposition to animal testing, is the aspect of activism that was chosen to be portrayed. It would not have been so easy to show inner conflict it the moral conflict was simply about stopping the eating of animals, because actually that does not pose such problems for Jains. if they had dared to explore the stopping of eating dairy, an activist Jain monk or nun that could have taken on the force of tradition, that, too, would have been an interesting story! Another media portrayal of Jain nuns is not so complimentary. William Dalrymple in “Nine Lives: In Search of the Sacred in Modern India” tells the story of a Mataji, a Digambara ascetic, who takes the nuns vows with a friend, only to watch the friend die of tuberculosis some years later because she refuses to take medicine, presumably because the medicine involved violence to animals. The friend who dies eventually fasts until death. The protagonist nun cries at her loss and is berated by her guru. She eventually appears to decide to fast to death herself,though she has no disease. This portrayal, like the whole book, strikes me as spectacle, rather than of sympathy. Dalrymple seems to point to the nuns and say, look how odd, these Jains just starve themselves, without distinguishing what is, at least to this medically trained reader, obvious depression in the protagonist nun leading her to lose interest in life. Her best friend is gone, her guru is un-supportive and she has previously renounced her ties to family and society. To me this rejection of life violates the reasons a Jain is to consider sallekhana. The moral question around the other nun not taking medicine for TB is not explored, written off as “tradition”. Though both Nine Lives and The Ship of Theseus show Jain ascetics grappling with mortality and ahimsa in Indian society, the former is decidedly less sympathetic. I can only hope that a real activist Jain ascetic can address the public misperceptions around Jain practice and promote a meaningful practice of ahimsa.The first sadhvi (Jain nun) to take the vows in the US was supportive of Prof Gary Francione’s message at JCNC in 2013. Will she or any other ascetic speak out for veganism? That will be a revolutionary moment in Jainism and possibly a media worthy one.